I have an acute weakness for towns or cities with canals – Amsterdam, Venice, Copenhagen. 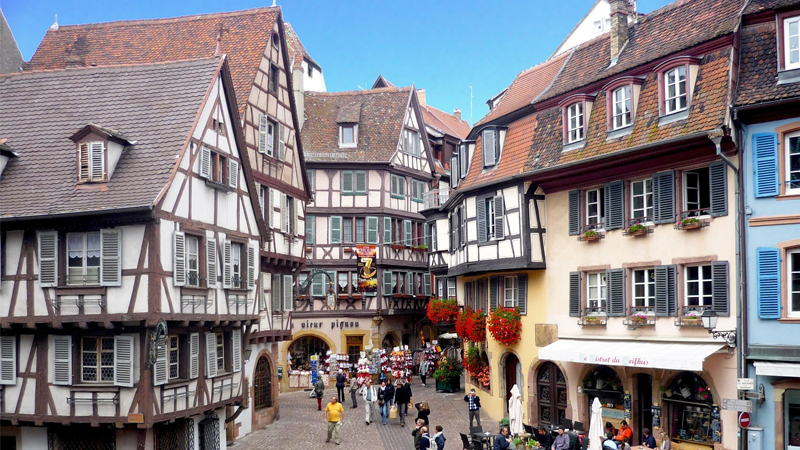 But one of my all-time favourites is Colmar in France’s Alsace region. This quaint town is perched on the edge of the Rhine river. This is where France meets Germany and these two distinct cultures intertwine to create a unique experience that is Colmar. History buffs might have heard the name Alsace Lorraine as the disputed region, which switched hands between Germany and France repeatedly and also partly contributed to both the World Wars. For those who have not, let me elaborate. After several years of the Swedish rule in the 17th century, Colmar joined the Kingdom of France. But, after 1871, the city returned to Germany until World War I. It was then reoccupied by the Germans during World War II. It was the last town in France to be liberated at the end of the war and it’s been French ever since. Owing to its swinging past, the locals switch between German and French languages effortlessly. 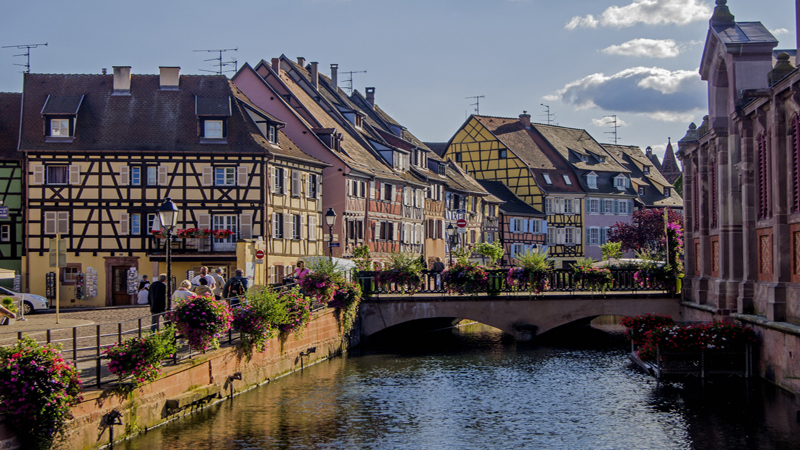 It is no surprise that one will notice the German influence on Colmar’s architecture – overflowing with half-timbered medieval buildings and flower-lined canals. Walking on the streets of Colmar, I could see my childhood fairytales come to life. There’s a wooden bell tower just perfect for Rapunzel to have let her hair down, tiny cottages that would make the perfect home for the Gingerbread man and a candy coloured bakery that Hansel and Gretel would have frequented. Any direction you look, there are pastel waterside houses, balconies overflowing with blooms, windows with heart cut-outs. The weekend was cold and it was a bit overcast, which added to the chill. However, that didn’t stop me from walking around the town as I wrapped myself in my coat. I finally reached the peak of prettiness in the area near the Quai de Poissonniers nicknamed Petit Venice. A walk along Petit Venice led me to St Peter’s Bridge where the view was a picture-perfect row of half-timbered houses by the canals. Some houses even date back to the 17th century, unscathed by the wars. Also, known as the merchants’ quarters, this is where the butchers, fishermen, pastry chefs, tanners lived back in the day. Having stopped at a nearby cheese and sausage stall, the owner shared a very likeable fact about Petit Venice. If he is to be believed then, the variety of colours the buildings adorned has a story to tell. Back in the day, the different colours were used to display the types of businesses – so for example, if you were a baker, your house would be pink or a fisherman would have a red house.